U.S. Agents Spray Tear Gas At Migrants, Briefly Close Tijuana Border Entry Many migrants have come to seek asylum in the U.S. — but the process for approval is slow, and resources in a makeshift shelter in Tijuana are running low. Migrants make their way across the almost-dry riverbed of the Tijuana River on their way to the El Chaparral port of entry to the U.S. in Tijuana, Mexico, on Nov. 25. U.S. agents fired tear gas at a group of migrants on Sunday as they tried to cross into the United States from Tijuana, Mexico. The incident took place at the San Ysidro Land Port of Entry between Tijuana and San Diego, where tens of thousands of people cross between the U.S. and Mexico each day. In recent days, more than 5,000 migrants have been camped in Tijuana after arriving in Mexico from Central America. 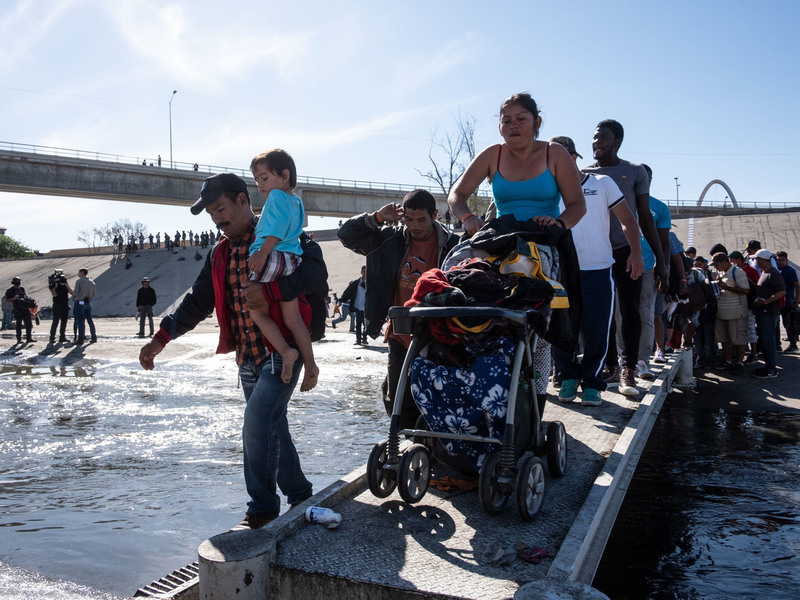 Many of the migrants are seeking to apply for asylum in the U.S., but as James Fredrick reported for NPR, fewer than 100 asylum petitions per day are being processed at the San Ysidro entry point. On Sunday, hundreds of migrants made their way through Tijuana towards the border. As they marched, Customs and Border Protection closed the San Ysidro Land Port of Entry between Tijuana and San Diego. The crossing was reopened later on Sunday. The group of migrants continued toward the border. Mexican police officers in riot gear stopped many, but those who continued toward the fence met U.S. border agents, who sprayed some with tear gas. Following the incident, the Mexican Interior Ministry said it will deport hundreds of migrants who attempted to "violently" cross the border. 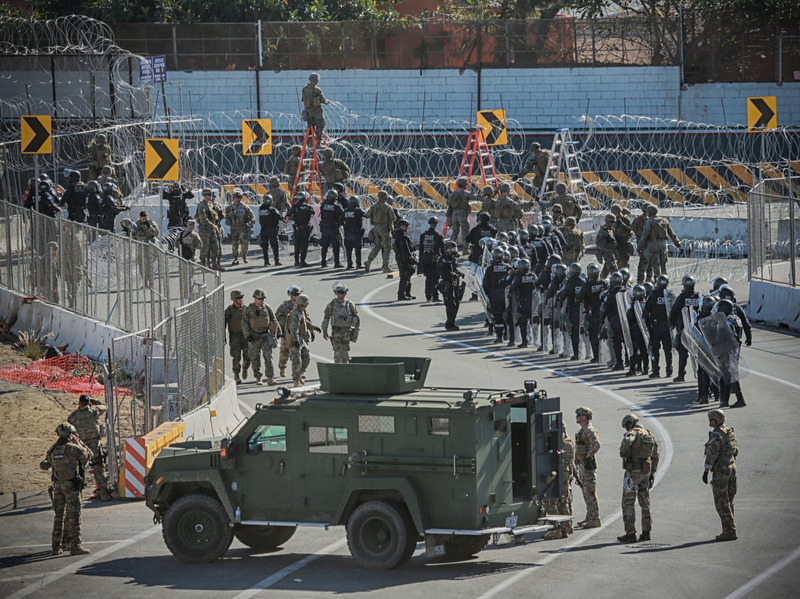 U.S. military and border agents secure the United States-Mexico border at the San Ysidro border crossing south of San Diego, Calif. on Nov. 25. "Every once in a while, a new group gathers there, at the U.S.-Mexico border fence — and then pretty quickly after that, they are dispersed using tear gas. It's pretty windy here today. I was probably half a mile from where the tear gas was shot, and I could feel it ... You saw lots of families, lots of kids who, although they weren't close there, have been feeling the effects of tear gas." The event occurred amid conflicting reports about the future of U.S. border policy. President Trump tweeted on Saturday that migrants wouldn't be allowed into the U.S. "until their claims are individually approved in court." A Washington Post report Saturday indicated that the U.S. and Mexico had come to a deal around such an arrangement, but in a separate report that followed, Mexican officials denied a deal had been made. President Trump then tweeted on Sunday morning, "Would be very SMART if Mexico would stop the Caravans long before they get to our Southern Border, or if originating countries would not let them form..."